"She is a famous beauty. She is nine months old. [Model] Baptiste [Giaconi] gave her to me for Christmas to watch for two weeks when he was away but then I refused to give her back. I thought she was too cute. She is like a kept woman. She has a strong personality. She has lunch and dinner with me on the table, with her own food. She doesn't touch my food. She doesn't want to eat on the floor. She sleeps under a pillow and she even knows how to use an iPad. She has two personal maids, for both night and day." "She is beyond spoiled," added the Kaiser, unnecessarily. Choupette, in case you were wondering, also is the subject of an unusually detailed diary, a sort of Kitten's Log. "We do keep a diary. When I am not there, the maids take down, in little books, everything she did, from what she ate, to how she behaved, if she was tired, and if she wasn't sleeping. In the nine months, we already have almost 600 pages. Colette had written a lot about cats. 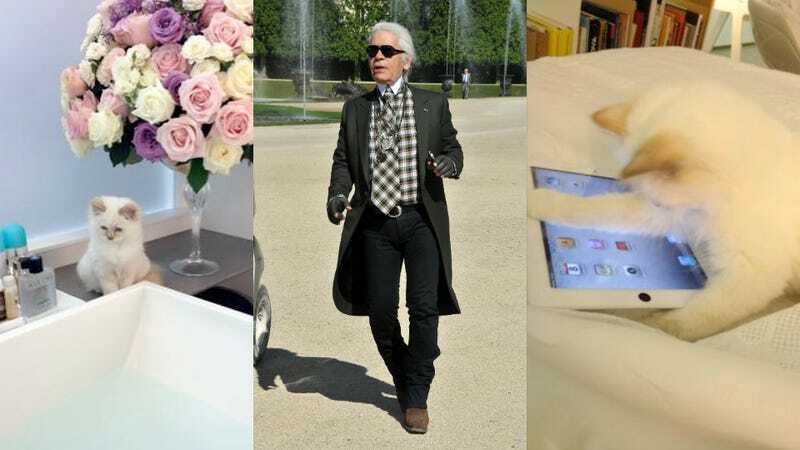 I am not Colette, but I think it could be funny to make a little book of Choupette's diary." "She is not a fashion person, so I don't criticize her [style]. Sometimes she could get a person who cuts the jackets and the pants a little better, but she has more serious things to do. She would be criticized that she would be too trendy." Sounds reasonable. But he's still not the kind of guy you'd want to lend your favorite shirt. UPDATE: Inevitably, Choupette now has a Twitter.